Shortly thereafter I received a separate response from the Saudi Embassy press office. With no comment, they sent this story written by The Hill’s Julian Pecquet and Jordy Yager: Saudi student hurt in Boston bombing not a suspect, not being deported. April 18, 2013 Email exchange. 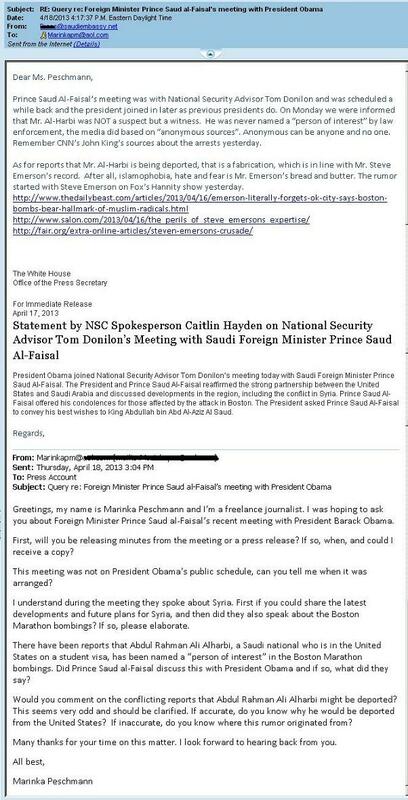 Prince Saud Al-Faisal’s meeting was with National Security Advisor Tom Donilon and was scheduled a while back and the president joined in later as previous presidents do. On Monday we were informed that Mr. Al-Harbi was NOT a suspect but a witness. He was never named a “person of interest” by law enforcement, the media did based on “anonymous sources”. Anonymous can be anyone and no one. Remember CNN’s John King’s sources about the arrests yesterday. As for reports that Mr. Al-Harbi is being deported, that is a fabrication, which is in line with Mr. Steve Emerson’s record. After all, islamophobia, hate and fear is Mr. Emerson’s bread and butter. The rumor started with Steve Emerson on Fox’s Hannity show yesterday. President Obama joined National Security Advisor Tom Donilon’s meeting today with Saudi Foreign Minister Prince Saud Al-Faisal. 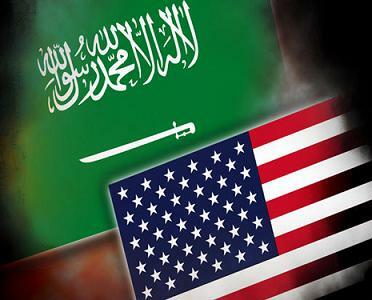 The President and Prince Saud Al-Faisal reaffirmed the strong partnership between the United States and Saudi Arabia and discussed developments in the region, including the conflict in Syria. Prince Saud Al-Faisal offered his condolences for those affected by the attack in Boston. The President asked Prince Saud Al-Faisal to convey his best wishes to King Abdullah bin Abd Al-Aziz Al Saud. Greetings, my name is Marinka Peschmann and I’m a freelance journalist. I was hoping to ask you about Foreign Minister Prince Saud al-Faisal’s recent meeting with President Barack Obama. First, will you be releasing minutes from the meeting or a press release? If so, when, and could I receive a copy? This meeting was not on President Obama’s public schedule, can you tell me when it was arranged? I understand during the meeting they spoke about Syria. First if you could share the latest developments and future plans for Syria, and then did they also speak about the Boston Marathon bombings? If so, please elaborate. There have been reports that Abdul Rahman Ali Alharbi, a Saudi national who is in the United States on a student visa, has been named a “person of interest” in the Boston Marathon bombings. Did Prince Saud al-Faisal discuss this with President Obama and if so, what did they say? Would you comment on the conflicting reports that Abdul Rahman Ali Alharbi might be deported? This seems very odd and should be clarified. If accurate, do you know why he would be deported from the United States? If inaccurate, do you know where this rumor originated from? Many thanks for your time on this matter. I look forward to hearing back from you.